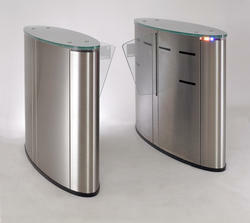 Tripod Turnstiles space features a compact, efficient design. The turnstile can integrate any access control system and can be mounted with the display, passage counter, card reader, token operation, traffic lights, command console, and alarm system. 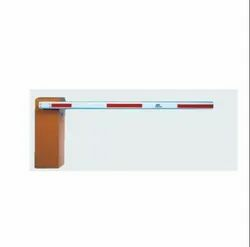 The entire range of Flap Barriers have been designed to provide quick and controlled access to restricted areas. These can be integrated either with card access systems or Fingerprint system to ensure quick and automatic clearance while keeping accurate entrance records. Ensuring security and crowd management at the entrance in areas with high pedestrian flow is a challenging task. To make this difficult task easier, Flap barriers are used. Designed for pedestrian entrance control, it helps to control and secure access, allowing only one person through at a time. A boom barrier, also known as a boom gate, is a bar, or pole pivoted to allow the boom to block vehicular access through a controlled point. Typically the tip of a boom gate rises in a vertical arc to a near vertical position. Boom gates are often counterweighted, so the pole is easily tipped. 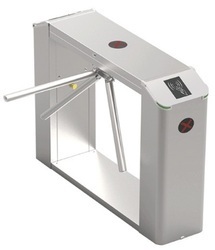 Looking for TURNSTILE TRIPODS SWING GATES AND BOOM BARRIERS ?